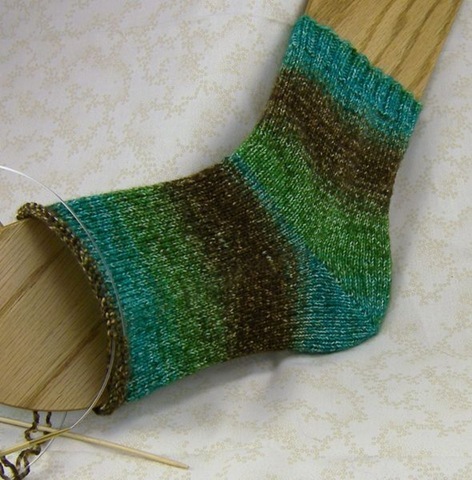 I was going to post some pictures of the Orencia socks that I had made such a big deal of before. I finished them on my trip to Virginia. But as I set the photo-shoot up, I realized that they really needed to be blocked. 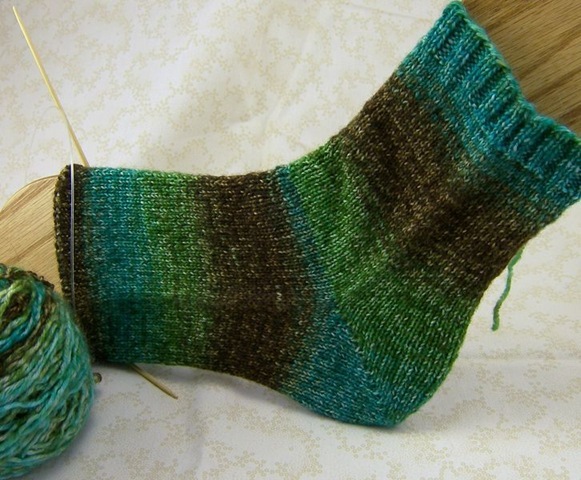 I don’t normally block socks, as they don’t really need much encouragement to look sock-shaped. But these socks are mostly lace and lace really shines after it’s been blocked. At least, I hope so. They looked a little shabby sitting there all wet and pinned down. I hope they recover! Anyway, I can’t take pictures of them while they’re in that state. That just wouldn’t be fair to them. So instead, I’ll give you an update on my cardigan. You know, the one that’s given me so much trouble so far? Now, I’ve dragged this thing all around the country. I took it to New Mexico, figuring that it was a good car project. Well, it was far too warm to be working on a wool sweater. I think I knit one row in the car. I took this sweater to Virginia. It stayed in the suitcase the entire time. Didn’t even look at it. Honestly, didn’t even think about it. But I finally took it out and worked on it this weekend. 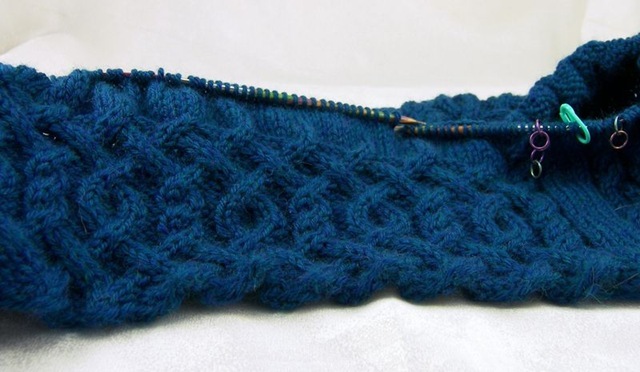 I finally finished the cabling around the bottom and I even have about seven rows of stockinette done. Of course, being the evil, evil project that it is, it punished me for my neglect. Having such nice cabling along the bottom means that I had to cast on more stitches for the bottom than I will need for the rest of the body, since cables cause the fabric to contract. 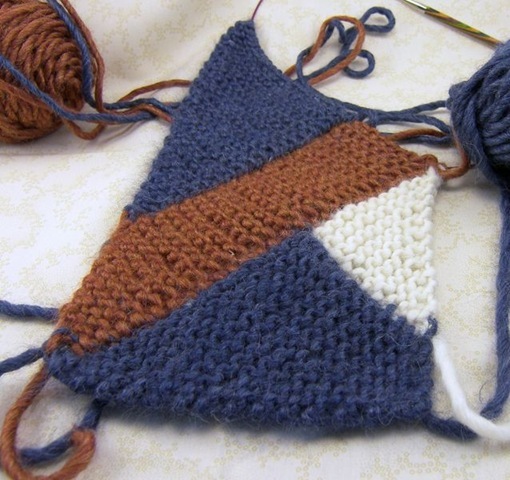 Easy, I thought, I’ll just add an extra repeat in the cable and then decrease the stitches out when I’m done. 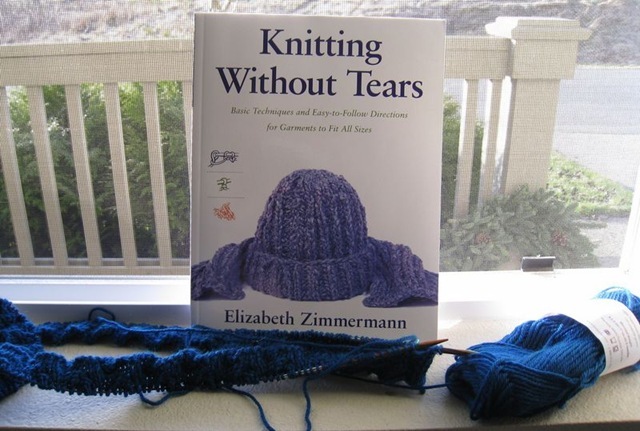 Well, that’s perfectly fine if you work on the project continuously and remember to decrease the sixteen stitches before knitting six more rows of almost three hundred stitches each! I decided not to rip back, as that would just have been too painful. So I dropped certain stitches and reknit them with decreases. This left me with some unsightly tension issues which I then had to tease back into place. It likely would have been faster to rip and reknit. But I’m stubborn and I did it the drop-and-reknit way. The decreases did finally all get into place, although I am making no claims to them being “evenly spaced.” In the picture above, you can see the five stitches that will form the steek for the zipper- or the nice stockinette stripe up the front if I chicken out on the steek. It has cables running up either side, which are the only bit of interest in the body anymore. It remains to be seen if I’ll go insane before I reach the underarms, but if I do it’ll be a toss up between the boredom or the cantankerous nature of this sweater. 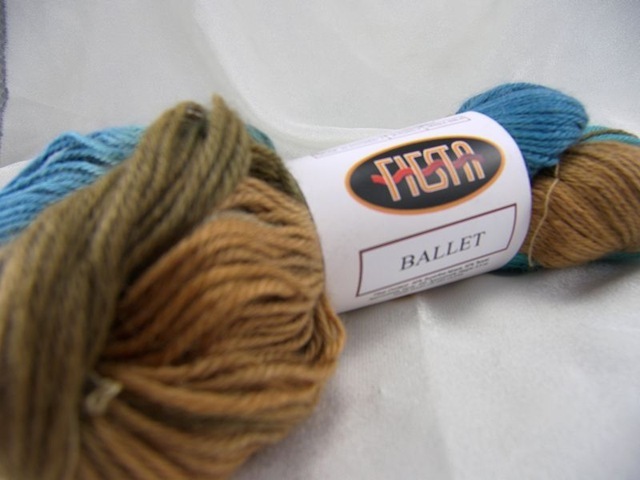 This was supposed to be a post about one of my favorite fibers. But instead I’m going to go see the Lion King (the stage show, not the movie) in a few minutes. 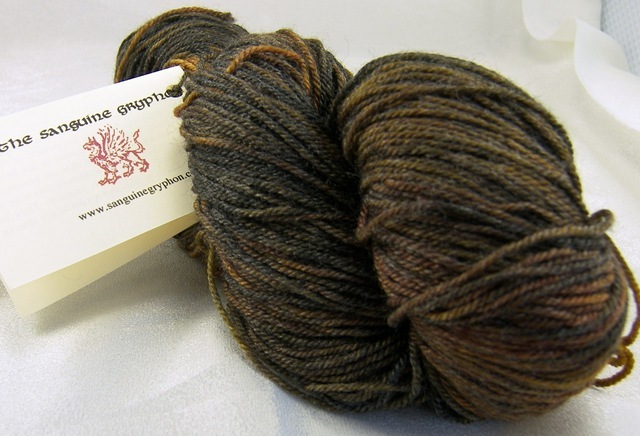 Tomorrow will be a post about one of my favorite fibers. The sweater/cardigan is coming along nicely after our rocky beginning. 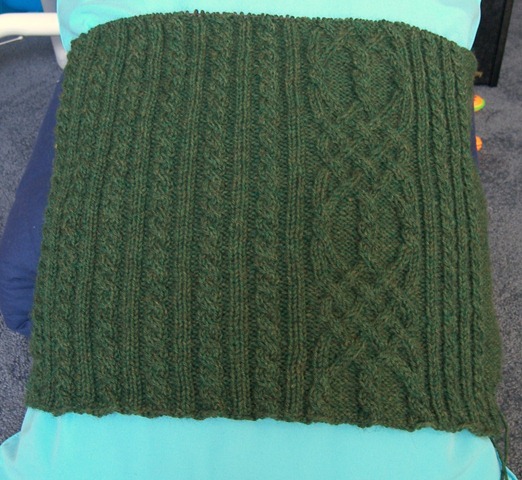 I really should have cast on flat and knit until the possibility of twisting was gone and then join in the round. I mean, I’m going to slice the thing open anyway… Oh well. 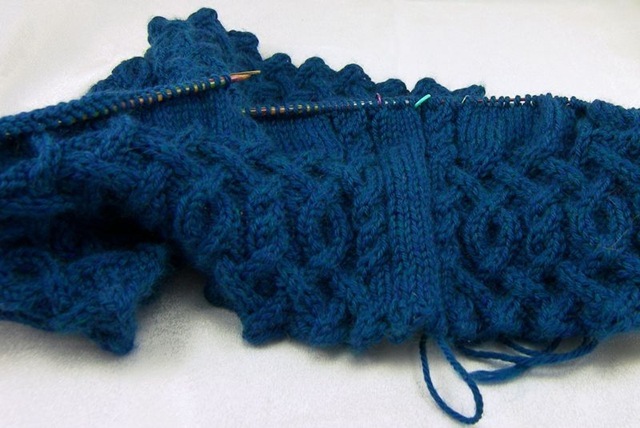 I’m almost done with the first section of cabling and am about to decrease some stitches (how many is still to be determined) and then start the long slog on on the body. More pictures soon! Seriously, cardigan? Just ten rounds in? That’s when you want to start fighting? Here’s what happened. I cast on 301 stitches. And I joined in the round, being very, very careful not to twist. I checked three times. No twist at any time. Happy and content, I proceeded to work my way around. Now, keep in mind that there was no twist in the cast on row, I swear. However, after Round Ten, I noticed a distinct turn and a half in my knitting. You can imagine my shock, especially having been so careful as to check multiple times before and after joining in the round. There was nothing for it. I had to rip the whole thing out. Oh, it was mad about it. It threw a hissy-fit about being frogged; tangling, sticking together, trying to grow extra ends to confuse me. 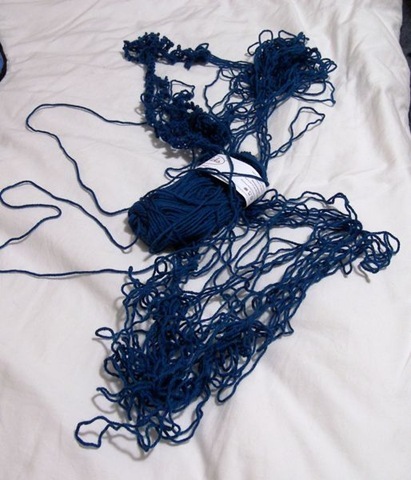 It took me almost an hour to untangle and re-ball that yarn. Grrrrr. This does not bode particularly well for the rest of the project. Especially since when I cast on again and knit a few rows, I had another twist! What is going on here?! Is there no way to join without twisting in this mixed up world? How many times do I have to check the cast on to make sure that it’s not twisted? I’m warning you, cardigan. You’d better start knitting straight or I’ll felt you into nothingness, superwash or not. That, my friends, is the first seven rows of my not-so-beginner-friendly cardigan. 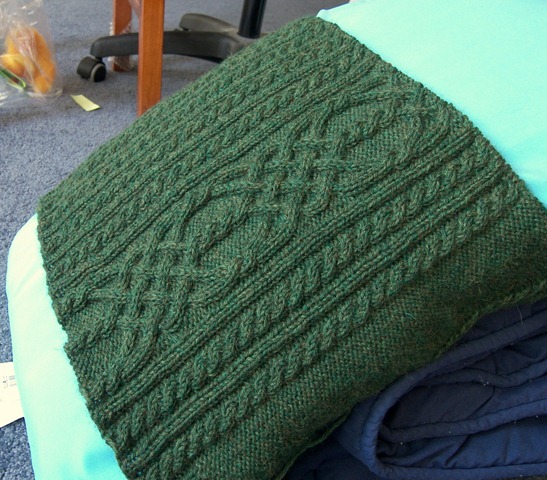 I can’t believe I’ve knit 7 rows already! I’m a small knitter at heart; I knit socks and mittens and cat toys. Even hats sometimes seem like too much of a commitment. “I have to cast on how many stitches? !” I always ask. I’ve developed a strong dislike for the process of casting on. It’s strange, because I remember that casting on was my favorite part as a kid. Of course, back then I was using the backwards loop method instead of the long-tail cast on. 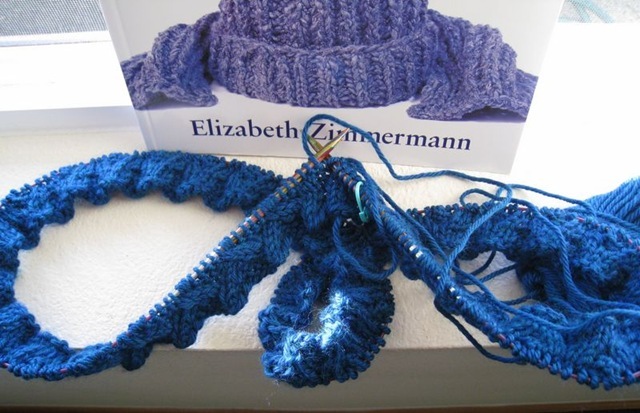 I loved the rhythm of casting on; I felt so capable and smart as the stitches flew onto my needle, lickety-quick. But now it just seems like an annoying hurdle to jump over before the real fun can begin. I think that my dislike of casting on stems from my sheer unadulterated hatred of chaining in crochet. I like to crochet, but I could never count the chains accurately. After having to rip out a chain of thirty, seventy, or one hundred stitches because I was 5 stitches short after the first row became really, really annoying. I always seek out projects with very few chains at the beginning. That, honestly, is one of the things that has kept me from starting a sweater or cardigan before now. The thought of casting on two hundred to three hundred stitches for a sweater knit in the round was highly unappealing. I have persevered, though, and as you can see below, I successfully cast on three hundred and one stitches last night. So far, the cardigan and I are having a very nice honeymoon after the chore of casting on. 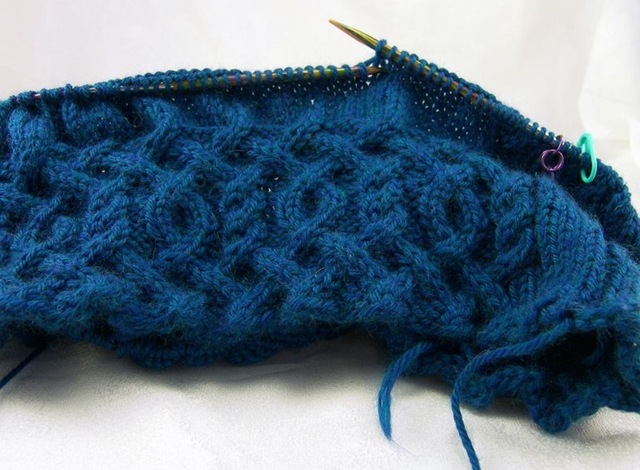 Things are moving along as fast as can be expected, the yarn is nice, and the needles are sharp. And I haven’t miscrossed a cable, which is always a bonus. Of course, it’s too warm outside to wear a light jacket, let alone a wool cardigan, but I’m in complete denial about that. It’s February, it must be cold, right? Ok, having carefully looked at my queue of projects and searched deep in my soul for the answers to life’s great questions, I have determined that, yes, I have enough time and sanity to knit a seamless raglan cardigan. Not just any cardigan, mind you, a cardigan that will be designed mostly on the fly, a cardigan that will include my first sleeves, and a cardigan that will include my first steek. Any sane person would choose a pattern already designed and written by a professional sweater-designer. But me? I like a challenge. Apparently. Also, have you noticed that “queue” is a really weird word? I was trying to type it and I honestly couldn’t remember how to spell it. It was inconceivable to me that it had “ueue” after the Q. Shouldn’t there be some sort of silent consonant in there? Maybe I should start spelling it “queuet.” The T is silent. Isn’t that better? So, the sweater/cardigan (it will start off life as a sweater before the *shudder* steek is cut up the center) will be knit from Knit Picks Swish Worsted, in Marine Heather. I know that I come across as the world’s biggest Knit Picks junkie. But I really like their yarns. 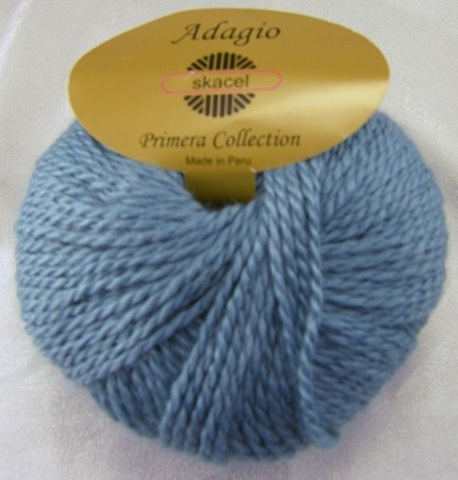 I think that they can’t be beat for a sturdy, good quality yarn for a low price. 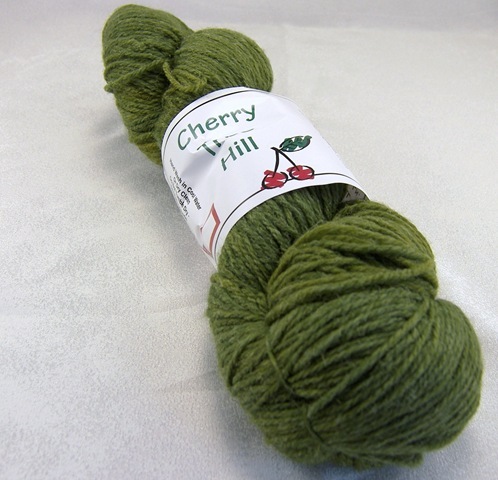 I love many, many non-Knit Picks yarns (mm, Road to China.) But I can’t afford them all the time. 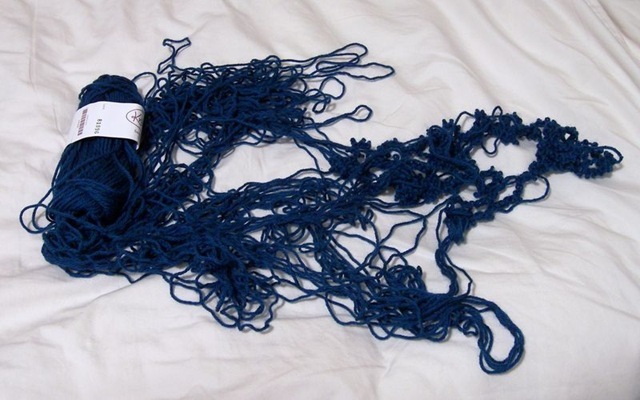 Especially since, well, it takes a lot of skeins to make something that goes around my whole torso. Aaaaaanyway. 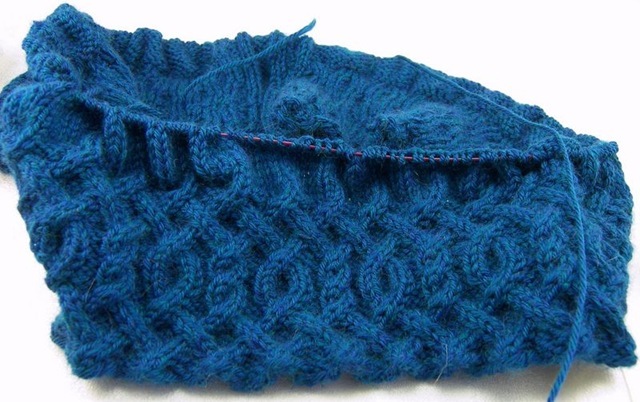 I’m thinking that the cardigan will have some nice cabling details. And if it turns out well, I’ll of course be publishing the pattern here. Here’s hoping that that’s the case. 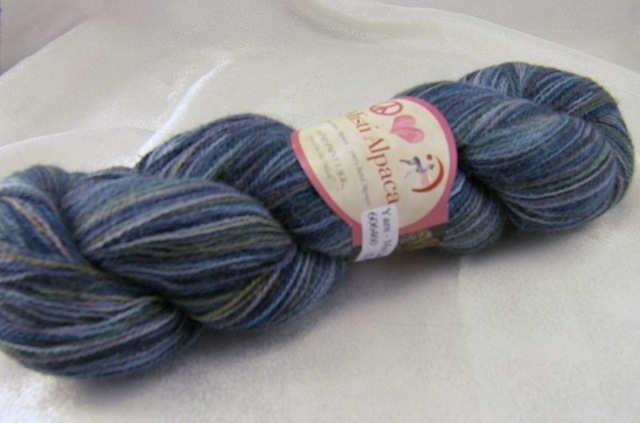 I mentioned some Misti Alpaca that my brother-in-law had bought me last time. After Christmas, we drove up to Vancouver for a few days and we spent some time in the Granville Market. Well, my mother-and brother-in-law spent more time than the rest of us, but that’s another story. They stopped in at Maiwa, a fiber supply store. This store is seriously cool. All kinds of yarns, books, fibers, and dyes. They had all natural dyes, too, from flowers and vegetables. I almost bought some, but I don’t really do enough dyeing to justify a big tub of ground marigold or indigo. The in-laws spent a while looking at different yarns, trying to decide what I’d like. 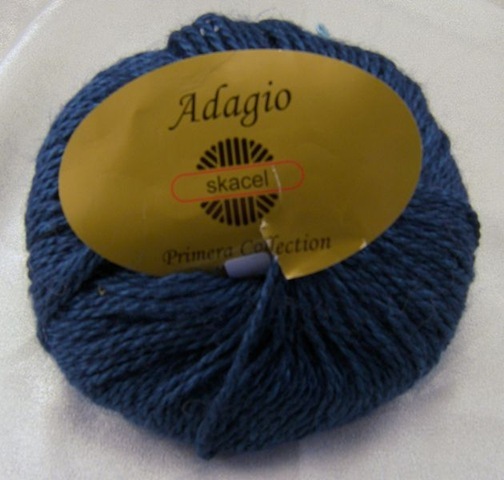 Actually, the second ball of Adagio wasn’t blue originally; it was gold, but when I went in to check out Maiwa for myself I couldn’t resist the combination of blues. You know how I am with blues. The laceweight presents an interesting quandary. Do I try my hand at a lace shawl? I’m not really a shawl-wearer. I love the colors, though. They’d be beautiful as a shawl. 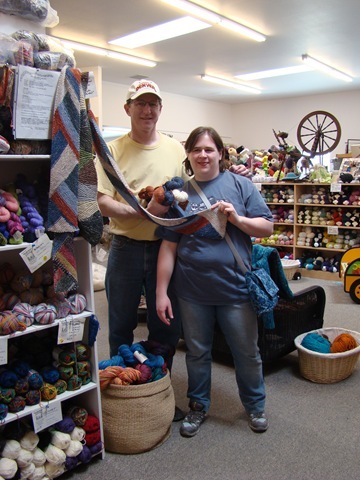 The employee at the store recommended holding the yarn doubled and making a scarf, which is probably what I’ll do. Shawl might be too much of a commitment right now, given my list of projects. This might be destined for a hat or something like that. It’s crazily soft. If I had more of it, I might have made it into a scarf too. I love souvenir yarn shopping.